Taylor Summers witnesses the death threat to a young boy, and does the only thing she can do—she sacrifices herself to distract the killers. Her reward is a life in ruins, on the run in the wilderness, barely surviving a bitter winter and the even more bitter knowledge she has lost everything: her career, her reputation, her identity. She finds refuge in Virtue Falls, and there comes face to face with the knowledge that, to live her life again, she must enlist the help of the man who does not trust her to defeat the man who would destroy her. She’s being hunted, but it’s time to turn the tables…. Now in paperback from Amazon, Barnes & Noble, Books-a-Million or IndieBound. Also available in hardcover from Barnes & Noble, IndieBound, Books-a-Million and in audio at Amazon, Barnes & Noble, IndieBound, iBooks, Books-a-Million or Audible. Add OBSESSION FALLS to your e-reader with Kindle, Nook, Kobo, GooglePlay, or iBooks. FREE! 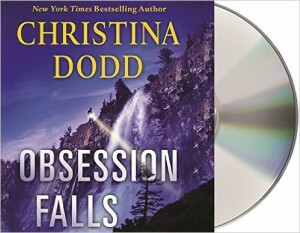 Listen to the first chapter of OBSESSION FALLS! Click on this link to listen or right-click (and select “save link as”) to download the first chapter of the audio book. 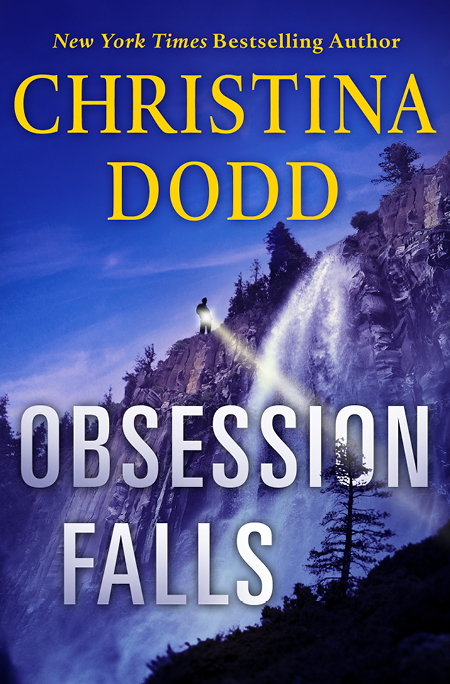 Christina Dodd and Jayne Ann Krentz discuss OBSESSION FALLS – Listen Here! In high school, Taylor’s art teacher had told her anyone could draw a mountain, but a true artist depicted the soul of the mountain, gave the viewer a sense of glorious austerity or forbidding heights or searing cold. A true artist created not art, but feelings: homesickness, longing, terror, love. Most of all, Taylor’s art teacher warned her against making mountains look like ice cream cones. Taylor could state with great assurance the mountains she had sketched did not look like ice cream cones. They looked like ingrown toenails. She rifled through her sketch pad, looking at each and every one of her drawings. How had she reduced the imperious majesty of the Idaho mountains to such a disgusting human condition? She had dreamed of and planned for this, imagined her artistic talent would blossom in the light of a place and time so long cherished in her childhood memories. Instead, here she sat alone at the edge of a wide mountain meadow, and she was earthbound, her soul firmly chained to a drawing pad and a pack of pencils. She was almost relieved when she heard a car bouncing along the washboard gravel road behind her. She shut her drawing tablet, stowed her pencil, slid off the rock and headed into the stand of pines. Not that she needed to hide. This was a national forest. But she was a woman alone. Sure, the car probably contained a rancher or some tourists. But wild game attracted out-of-season hunters, old gold claims dotted the creeks, and longtime residents carried guns. Up here in this wilderness, it was better to be safe than sorry. She wound her way into the shadows of the trees, watching to see who had trekked so far into the backcountry. When a black Mercedes came around the bend, hitting every rut as if it was a personal challenge, she grinned. Tourists. Rich tourists. She wondered how far they would make it before they destroyed their car’s oil pan on an inconveniently placed rock. They probably didn’t have a clue where they were or where the road was headed, which was nowhere. Anyway, they didn’t go much further. They passed out of sight behind a boulder as big as a house, and there the sound of the engine cut out. She glanced at her watch. Two-thirty. Pretty soon, she needed to return to her rental Cherokee, too. It was a good two hours back to Sun Valley. She started deeper into the woods, looking for something less imposing to sketch. A tree, maybe. Or a bug. On the road, two doors slammed. Him? Out of the trunk? She didn’t like this guy’s tone. She didn’t like his words. Who was in the trunk? “Do you think this is far enough?” The other man sounded itchy, nervous. She froze. Finish him? Dump the body? She felt disoriented. Birds were twittering. Above her, massive douglas fir trees wrapped the heavens in their branches and sang a song to the wind. And someone within her earshot was talking about … dumping the body? The trunk latch opened with barely a sound. A child’s scream filled the air. This couldn’t be happening. Taylor could not be up here, alone in the most peaceful place on earth, not far from where she’d been born, trying to get back her artistic mojo … and bear witness to a murder. A child’s murder. Taylor did not want to be here. But she was. As they pulled the kid out of the trunk, it screamed as if it was in agony. She left the shelter of the trees and moved quietly into place behind a boulder as big as a house. Dense. Tall. Rolled into place by some ice age glacier. With her back against the rough stone, she slid and looked, slid and looked. Finally the car came into view. Pistols, big pistols, held with casual familiarity in the men’s hands. One guy was bulky and narrow-eyed. He was in charge. One was thin and muttering. The boy … the boy was about eight, white-faced, dark-haired, covered with vomit. Terrified. Taylor was terrified, too. Her hands trembled. Her knees shook. Her heart thundered in her ears. But she could hear the casual slap Mr. Skinny gave the boy. The boy sobbed more softly. She looked again. She recognized the big guy. Seamore Dash Roberts, running back, Miami Dolphins, big scandal, jail time … yeah. The other guy wasn’t anybody. He was just, you know, sweaty. Good. Good. She could ID these guys … when she got down to the police department. After they’d murdered that little boy. The boy’s crying gave a hitch. He was terrified. Yes, he was. But he was also eyeing the men, looking around at his surroundings, like he knew he had to save himself. He was old enough to know he was going to die, and young enough to not really understand. Well. Who did understand? She didn’t. She wished she could help him. But there was no way. She wasn’t carrying a gun. She couldn’t just run at these guys, guys who were obviously professional hit men. All she would do is die, too. That wouldn’t help the boy. She could do nothing but watch helplessly. Even as she thought that, she was quietly, relentlessly tearing the sheets out of her drawing tablet. They were eight by eleven, good sized sheets of paper with whipped cream clouds and ingrown toenail mountains. Or rather — it was a stupid plan. But the wind was blowing. The stand of trees was no more than twenty yards away. If she ran fast enough and dodged quickly enough, she could get away. And she couldn’t stand to live the rest of her life knowing she didn’t make even the most feeble attempt to save a child from murder by two professional killers. She heard her father’s voice in her head. Taylor, you can’t outrun a bullet. She knew it. She really did. But the boy’s crying was getting louder again, the men more silent. The men were getting down to business, which was to murder the child. When she had freed a dozen sheets of paper, she put the tablet on the ground and stepped on it. Holding three sheets high above her head like unformed paper airplanes, she let the wind catch them, heard them flap, took a breath — and released them. She thought she would hear the sheets of paper as the wind carried them into the meadow. Into view of the hit men. To distract them. From the kid. To attract their attention. To her. To give the kid a chance to escape. She didn’t hear the flap of the papers. All she heard was the red buzz of fear in her ears. She zigged out into the meadow into plain sight of the gunmen, then zagged back behind the boulder. A gunshot. She heard the gunshot. Loud. Sharp. Cruel. Close. To her. So they’d seen her. Yay. "Run, kid!" she yelled. She glanced behind her. Seamore Dash Roberts came around the boulder, pistol in hand. Moving fast. She had the lead. Good. But he was a running back. Got the nickname “Dash” because he was fast. Bad. Very bad. To beat him, she had to run straight toward the trees as fast as she could. To live, she needed to zigzag. Oh, God. Oh, God. Please, God. He missed because he had a pistol. That was good for her. Pistols were meant for close work. Hard to aim. Best he could do was thirty to forty feet if he was skilled, and he’d have to stop to really get a bead on her. The forest. She had to get to the forest. She reached the shelter of the trees. She’d made it. She glanced back. He stopped, braced his feet, raised his pistol. She ducked behind a tree. A shot shattered the bark beside her. This was good. Because if he was shooting at her, he wasn't killing the kid. She ran again, glanced back. She should be counting. He only had six shots … unless that was an automatic pistol in which case —This was no time for math. Run, damn it.